I’m looking for a small graph $G$ whose vector chromatic number is smaller than the chromatic number, $\chi_v(G)<\chi(G)$. I think I have an example graph $K$ with $\chi_v(K)=4$ and $\chi(K)=8$ (based on computer calculation). 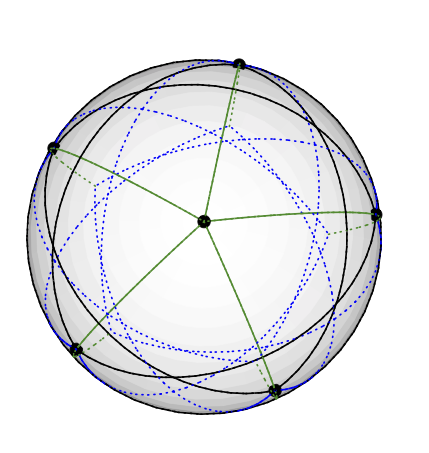 This graph has 20 vertices and 90 edges. Is there a smaller example? A tempting avenue would be to provide a concrete vector 3-colouring of the Chvatal or Grötzsch graph, if such a beast exists. I couldn’t resist thinking about vector 3-colouring the Chvátal and Grötzsch graphs. According to an SDP solver, Chvátal also admits a vector 3-colouring, but the output is just a bunch of vectors in 5 dimensions that I have difficulties interpreting. 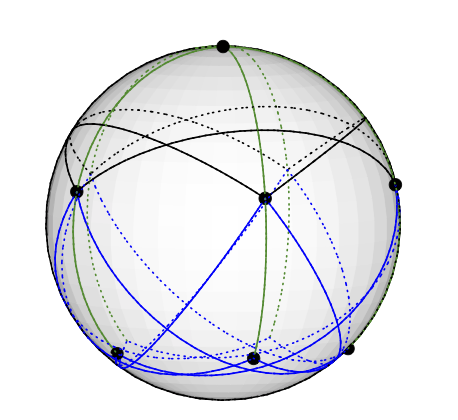 Here it an embedding of the Grötzsch graph on the unit sphere: This corresponds to a vector colouring in the obvious way; e.g., the vertex at the North pole is coloured with the vector (0,0,1). 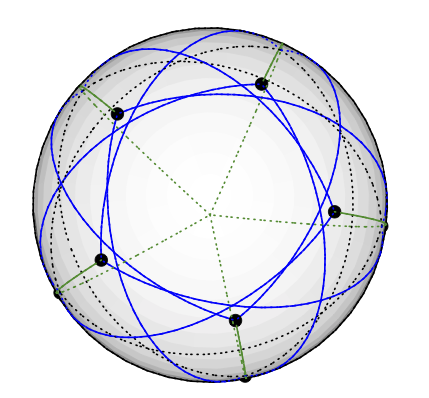 The Grötsch graph has 3 types of nodes. A single degree 5 nodes (at North). Five degree 4 nodes (on the Northern hemisphere, equidistant to N, you can make out 3 of them). Five degree 3 nodes (on the Southern hemisphere, equidistant to N, you can make out 3 of them). Not the answer you're looking for? Browse other questions tagged ds.algorithms graph-theory co.combinatorics graph-algorithms graph-colouring or ask your own question.